Whew! We made it through the holidays in one piece and we even got the New Year kicked off in style, New Orleans style to be specific, where my beloved Oklahoma Sooners succeeded in becoming the BCS Sugar Bowl Champions. Now that we made it through all the craziness our lives can return to normal (whatever that is?). Christmas was amazing for me this year, my culinary mind is running on high thanks to a gift from the big jolly fellow himself. Santa brought me a Big Green Egg grill so you guys can look forward to a lot more yummy grilled dishes and homemade pizzas. This grill is seriously one of the "must haves" for anyone that likes to cook out on a grill. I just had a shrimp and black bean pizza in Cabo while vacationing with my family that I can't wait to try to recreate for y'all. In the meantime, I want to chat about a Christmas present for your family for next year. It may feel weird to start planning family Christmas gifts for 2014 but I wanted to give you a head start on a gift that will blow your family away. It is time consuming but well worth the work and well worth the happiness it will bring you and your loved ones for years to come. As a gift to my family on Christmas 2012 I decided to privately publish a cookbook titled, On The Tip Of My Tongue: A Collection of Recipes from My Family of Cooks, Food Lovers and Feast Organizers. I spent 12-14 hours a day for a month. Ofcourse, I had my brilliant idea about 5 weeks before Christmas so I had to cram all of the work into 4 weeks which is why I'm giving you the ENTIRE YEAR to plan and produce! 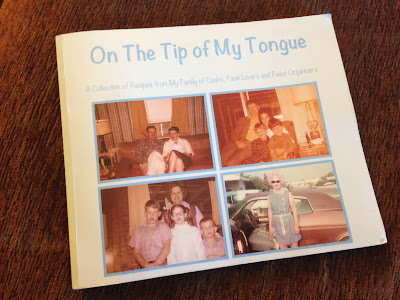 My cookbook is a 240 page collection of old family photos and recipes from both of my great-great-grandmothers on my Dad's side all the way down to my own recipes. And I did not even have time to include half of the recipes! 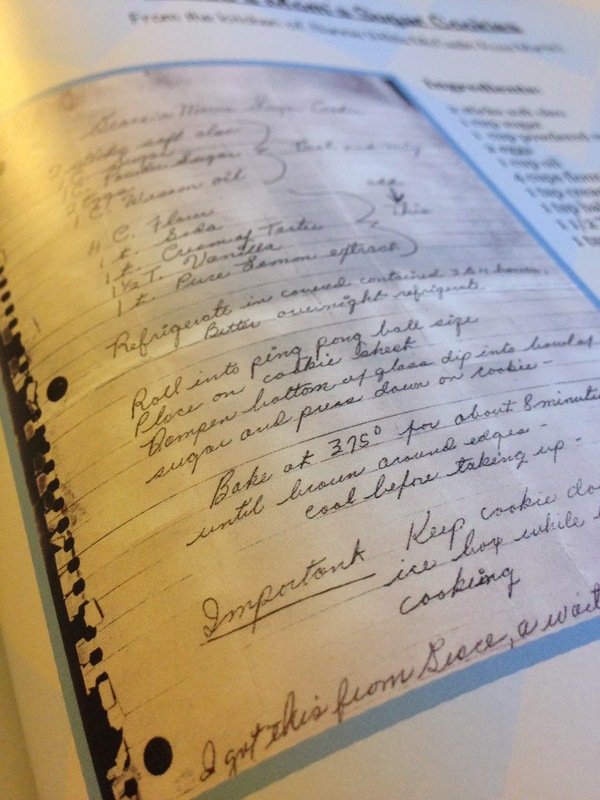 I scanned in hand written recipes and used them as photos in the book as well. 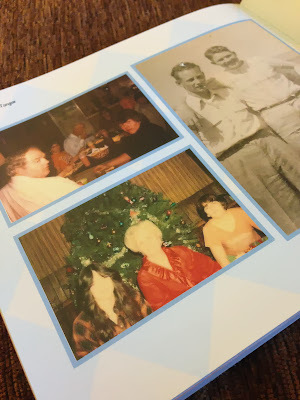 I used old family photos for the cover! That is my dad on the bottom left and my Grannie and Poppa sitting on the couch on the top left. She looked just like Patsy Cline. When I had a family recipe written out in a family members own hand-writing, I would scan it in and use it as an image on the same page where the type-written recipe is. This is my way of preserving the nostalgia of having it in my loved ones hand-writing and keeping all of the little notes that tend to find their way onto those pages. Again, I filled some pages with only photos because I wanted it to be as much about the photos and memories as the recipes. The final touch was actually an after-thought. 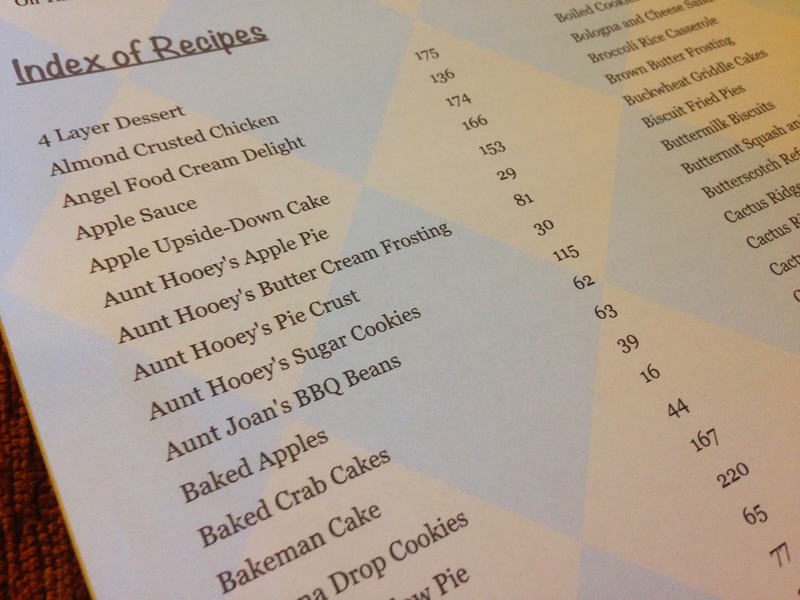 I knew that finding a specific recipe would be a hard task because I did not alphabetize the recipes in the book. 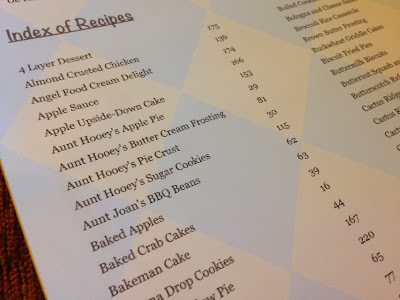 I used an Excel spreadsheet and typed every title and page number in side-by-side columns and then sorted the info A to Z to create an "Index of Recipes" which has proved to be helpful now that I actually use the book. Keep that in mind as you build your book. Brides would love it! Closer to wedding season I'll post another idea along the same lines for brides-to-be and their groom. Thanks for sharing this, I might have to get with my MIL and get some of their Italian recipes. I actually have one of those Warrior cookbooks around here somewhere!! Like a previous commentor mentioned, this is a great idea for a bridal shower. When my sister was getting married I put a blank receipe card in each bridal shower invitation and asked everyone to share a favorite recipe with her and then had a recipe box for everyone to put them in. Putting them in a book like this would also be great fun . I also have quite a few of those "looseleaf" recipes with notes, crossed out ingredients, and food stains...I imagine the cookbook pages are printed on some sort of protective/durable paper product??? Thanks for sharing amother great idea. P.S. Congrats on your Big Green Egg Grill!